 Public Lab: Can someone make a map to display NOAA Harvey imagery with coordinates and permalink? Question: Can someone make a map to display NOAA Harvey imagery with coordinates and permalink? I think the NOAA map is probably using some kind of standard map tile display. Can someone write a map with those features that loads the same imagery sets to make it easier for people to report pollution? 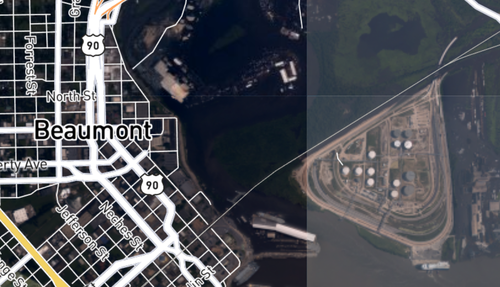 Adding coordinates to a Mapbox GL map is pretty straight forward. Not sure that Mapbox GL supports permalinks, but then again I might be misunderstanding this exchange. I did find a permalink solution for Leaflet, but I think you'd have to do something like this which probably defeats the whole purpose of Mapbox GL. Getting the NOAA data in there is a step beyond me. If somebody wants to point me to a repo for this map, I'll add the coordinates code. Actually, looking at the source code this is just mapbox.js and not mapbox-gl.js. So that permalink solution should work, might need something else for the coordinates. There's a good thread going on Twitter on this! Do you want this added to the current map, or do you need a whole new one? Is there anyone but me responding to the Twitter? Hi, @jbreen -- I'm working on a related Leaflet project if you still have any time to add in the permalink and coords plugins you found -- https://github.com/publiclab/leaflet-archive is designed to try to display a map based on an https://Archive.org image collection, using the GPS Exif tags. If you're looking for a project! Trying to widen the set of imagery we can run through this workflow. Hi @warren -- just sent you a pull request. I work on the NOAA pages. I just added permalinks and mouseover lat/lon coords to both the Hurricane Harvey and Irma imagery pages. The changes should be live tomorrow morning. That's tremendous, thank you Jason! Much obliged. Wow this is super amazing! Thank you @jasonwool ! So great to meet you. Let me know if it doesn't work as expected. Thanks for what you guys do! Hi, @jasonwool - this doesn't seem to be working anymore; can you confirm if it's still up and running? Thanks! hey - Yeah, it seems to be ok here. Working for me in Chrome and FF. What type of error are you seeing? Oh super, it's working again now. Weird, i wonder if it was related to caching somehow... anyways looks good now! Thanks again! @jasonwool TY for the quick help! @jasonwool - if you're interested, we would LOVE to meet you in person at the Public Lab Barnraising -- https://publiclab.org/barnraising -- Nov 3-5 in Cocodrie, Louisiana; this is our annual community event and Harvey and Irma imagery (as well as other disaster response issues) will surely be one of the big topics this year. Cool! Thanks for the invite. I'll see what I can do. What are some sources of new aerial imagery of Harvey damages? How do I identify an oil sheen or spill or slick in aerial photography? How do I join a volunteer Disaster Response Team for flooding? How do I share lots (gigabytes, or thousands) of photos online, cheaply and easily? What is the best way to formalize connecting needs with offers?